Many different elements in a person’s life can cause hair loss. From stress to the normal aging process, hair loss happens to many people. The American Hair Loss Association reports that 95 percent of men who experience hair loss do so because of androgenetic alopecia, or common male pattern baldness. Not only that, two thirds of American men will experience some kind of hair loss. PRP Therapy— or Platelet Rich Plasma Therapy is now one of the most sought after services in our El Paso Clinic, Dermatology & Aesthetic Center of El Paso and Rejuvené MD. PRP Therapy is a non-surgical process that stimulates the scalp, skin, and hair follicles and regenerates the growth of healthier, stronger cells using the body’s own healing powers. Platelet-Rich Plasma (PRP) can re-energize your hair cells to promote hair growth. Hair has a regular programmed cycle with specific growing phases. There is the growth phase, rest phase, and shedding phase. A stressful or traumatic event can shock the cycle. This will cause the body to push more hair into the shedding phase. You will notice the hair loss about six months after the stressful event. A lack of protein can cause hair loss as well. Our physician, Dr. Karen is board certified and has been trained in New York by some of the leading national physicians that established this treatment. We perform this treatment as an option for both men and women experiencing hair loss or thinning. Blood is drawn in our office and then spun in a centrifuge so the PRP is separated then removed. The physician will administer an anesthetic block to the nerves in the scalp. Then the PRP is injected into the scalp. Male pattern baldness is a big cause of hair loss in men. This condition happens to every two out of three men by the age of 60. It is caused by genetics and male hormones and usually starts at the temples leaving the classic M-shaped hairline. At the Dermatology & Aesthetics Center of El Paso and Rejuvené MD , we provide comprehensive and complete care. The first thing our physician does is provide a full clinical assessment. Our physicians will find out what type of hair loss you have experienced and label it temporary or permanent. They may decide to prescribe medication for a period of time or perhaps shampoos and hair care products. Initially we make a clinical assessment of the type of hair loss. We determine if it’s temporary which will happen in patches known and is known as Alopecia Areata. It may be a scarring type of hair loss. Or we determine if its the most common androgenic alopecia that affects women and men. Our physicians also recommend supplements. As with other procedures, no two patients are the same, so everyone receives comprehensive care at our center here in El Paso. They will decide if prescription meds are necessary for a period of time, we recommend shampoos and hair care and then the aesthetic procedure known as Hair Restoration with PRP (Platelet Rich Plasma). Female-pattern hair loss is similar to male pattern baldness. It is commonly referred to as androgenic or androgenetic alopecia. Women experience hair thinning instead of a receding hairline. It also tends to be hereditary. Switching or discontinuing birth control pills can cause hair loss as well. Anemia is another culprit. Women also experience hair loss at times due to overstyling. Tight braids, hair weaves, corn rows, hot tools, and chemicals can all cause hair loss when done in excess. Sometimes excessive hair styling can affect the root, in which case the hair won’t grow back. Human blood contains mesenchymal stem cells and other elements that are crucial for growth and tissue regeneration in wounds. It has proven successful in the past for neurosurgery, oral surgery, and sports medicine. It shows promising evidence that it can be helpful for hair regeneration. The treatment is new and cutting edge, but shows promising evidence that it can be helpful for hair regeneration. 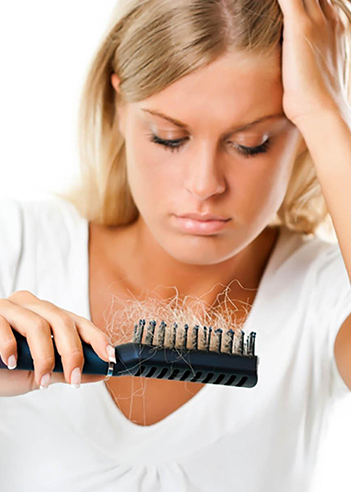 Hypothyroidism is another reason for hair loss in both men and women. The thyroid is responsible for producing hormones that control metabolism. When your body doesn’t put out enough of these hormones, hair loss might happen. If you suspect this or have other related symptoms, you should visit your doctor to run tests. Certain autoimmune diseases can cause hair loss as well. Many prescription drugs are accompanied by side effects that may include hair loss.